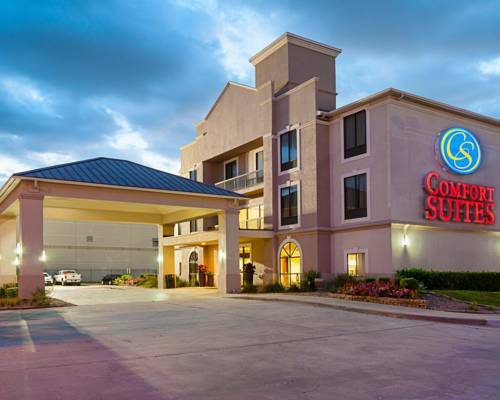 Get more of the space you need to spread out, relax or work at the smoke-free Comfort Suites hotel in Houston, TX located off of Sam Houston Parkway Beltway 8 near Baseball USA. Our smoke-free hotel is located near attractions like George R. Brown Convention Center, Minute Maid Park, Reliant Park and Sam Houston Race Park. Enjoy free hot breakfast, free WiFi, outdoor pool and hot tub, fitness center, business center, meeting room, guest laundry and spa. Your spacious suite offers a flat-screen TV, coffee maker, hair dryer, iron and ironing board. Also, earn rewards including free nights and gift cards with our Choice Privileges Rewards program.